“Looking forward to seeing you guys on our UK/Euro tour where we’ll play Among The Living in its entirety,” says drummer Charlie Benante. “You’re gonna hear songs like ‘I AmThe Law,’ ‘Imitation Of Life’….we’re gonna play ‘Heart Of It All’, ‘One World’, yadda yadda yadda. 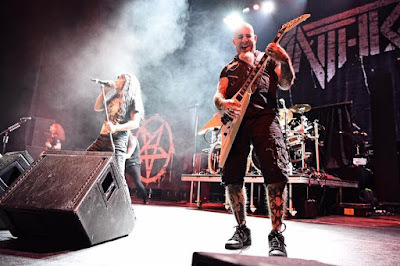 Anthrax will launch the early 2017 run on February 19 in Utrecht, The Netherlands, with shows wrapping up in Paris, France on March 16. The New York band’s third release, “Among The Living” peaked at No. 62 in the US but delivered a breakthrough by hitting the Top 20 in the UK on its way to Silver status for sales of more than 60,000 copies. Both singles from the record – “I Am The Law” and “Indians” – placed in the Top 50 on the UK singles charts. Ahead of the European tour, Anthrax will perform on the four-day 70,000 Tons Of Metal cruise, which features 60 bands including Death Angel, Uli Jon Roth, DevilDriver and Gojira, among others.